As part of my preparation for the Susitna 100 next month, I had to build a sled to haul my 15+ pounds of required gear. Much to my frustration, I had trouble finding much good information online on building a sled for winter running. I did find some decent information on building a pulk, but those are typically geared toward hikers and/or hunters pulling a much larger load, often travelling across unpacked snow. Some of the ideas are transferable, but many are not. I also spent a fair amount of time talking to other runners I know who have done this race, and asked them about how they built their sleds. I even went as far as scouring the intertubes for photos of runners pulling sleds, zooming in and gathering as much information as I could about their sled construction. I wanted my sled to be as simple as possible, with the least likelihood of something breaking during the race. If something did break, what would be the easiest to repair out on the course? For several years now, I’ve considered running the Susitna 100, but had just never taken that leap. Running a 100 miler in the middle of winter is a whole different beast than running one in the summer. There’s already plenty of things that can go wrong during a “normal” 100 miler – running one in the middle of the Alaskan winter adds even more to that list. Well, this year I finally committed and signed up. Like many winter races in Alaska, you can choose to either run, bike or ski this event. There is also a 50k that I ran 2 years ago. It may be well into November, but winter still hasn’t really hit in this part of Alaska yet. We got a few inches of early-season snow, with nothing since then. Instead, we’ve had several rounds of freeze-thaw-freeze-thaw, leaving our sidewalks and trails covered in ice. Still wanting to get outside and run, but not wanting to fall and hurt myself, I properly studded my shoes several weeks ago. I’ve tried numerous traction devices for running in the winter on snow and ice, and have found simply inserting screws into my shoes to be the most effective, and (better yet) the least expensive method. Even with studs in my shoes, things can get a bit perilous on glare ice, of which we currently have plenty. Over the years, I’ve learned to slow down and alter my foot fall a bit to ensure I stay vertical. Another sneaky technique I’ve used for dealing with the ice is to run on the indoor track at The Dome. Back in October, they had a great deal on annual memberships. My dear wife, not wanting me to injure myself, got me a membership. My son has karate two nights a week, and his dojo just so happens to only be a few blocks away from the Dome. So I’ve been spending a lot of time lately running around in circles while my son learns the touch of death. No, it’s not the same as running outdoors, but it is nice not having to deal with the ice, and being able to just run in a t-shirt and shorts. What are your tips and techniques for dealing with running on ice? So, it’s been a few months since I’ve really been running regularly. To be completely honest, it all started going downhill last fall when I DNF’d Pine to Palm 100. It was a tough course, to be sure, but I was well trained and ready for the 20,000 feet of climbing ahead of me. Instead, it was the heat that got to me. It got up to 100 degrees on the day of the race, and this Alaska boy just isn’t used to that kind of heat. The most insulting part was that both the weekend before and after the race, it was in the 70’s, which would have been entirely manageable. The main problem it caused for me is that I just couldn’t keep my heart rate under control. Running on a flat section of trail, or even downhill, my heart rate was going crazy, which forced me to take regular walking breaks to get my breathing under control. I was trying every trick in the book to cool myself off at the aid stations. 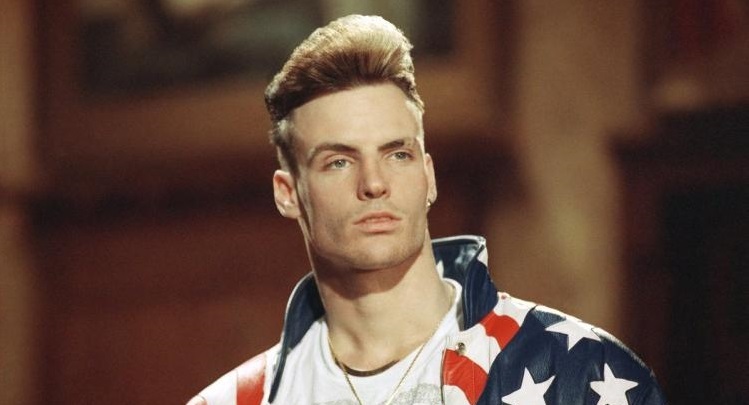 I poured ice water over my head, neck and back, tied a bandanna full of ice around my neck, but none of that was making a big enough of a difference for me. I do feel good about the fact that I never quit, I kept pushing even when I felt like crap, but I was moving so slowly that I missed the cutoff at mile 42. This was my first DNF, and I took it pretty hard. I had trained all summer for this race, flown to Seattle and then drove all the way down to southern Oregon with Sharla, my awesome crew for the weekend. I had a lot invested in this race – physically, financially, and emotionally. After returning home defeated, I told myself I would take it easy for a month or two, and not sign up for any races anytime soon. As we moved into winter, and still not having any races on my schedule, I found it easier and easier to make excuses not to go for a run. At this point, I was running once, maybe twice a week, for just a few miles at a time. Then December hit, and my mother got sick and spent several weeks in the ICU before passing away on Christmas Eve. Needless to say, December was a very difficult month for me and my family, and I ran very little. Around the first week of January, my wife kept telling me that I needed to “get my mojo back” and get back into running more regularly. So as a late Christmas present, she signed me for a 13 week running group put on by the local running store. The group meets twice a week – Thursday nights at The Dome for a track/speed workout, and a Saturday morning long run starting and ending at their store. I’ll be honest, I was a little skeptical of the whole thing at first. I’ve never followed any sort of structured training program or done regular group runs like this. But I decided to go into it with an open mind and a smile on my face, and I’ve been very happy with the results. The track workouts have actually been a lot of fun. I’ve spent so much time focusing on longer races the past couple of years, that I have mostly neglected speed work, so it’s been fun doing some faster runs lately. So far the longest long run we’ve done has only been 75 minutes, but I’ve still really enjoyed the group atmosphere and camaraderie. The past several weeks, I’ve been running 4-5 times per week. Last week was my birthday, and I even got out for a 34km “birthday run”, which was the farthest I’ve run in several months now. 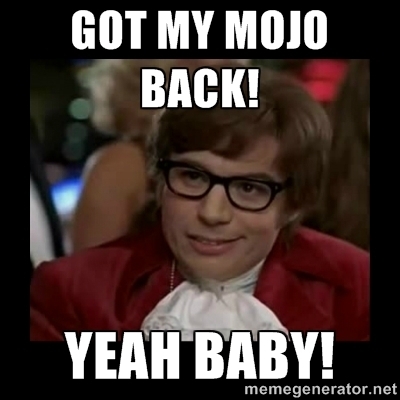 It’s all been feeling great, and at this point, I think I can safely say that I’ve got my mojo back! The first weekend of January, I ran the Frosty Bottom 50 (full disclosure: it’s actually more like 44 miles, but I guess the Frosty Bottom 44 doesn’t have quite the same ring to it). For a number of reasons, let’s just say that I did not go into this race with the ideal amount of training. To my surprise, it didn’t go as horrible as I had expected. In fact, my time was almost exactly the same as last year. Maybe it is possible to run an ultra on minimal training! Back at the end of November, the weekend after Thanksgiving, I hurt my back. I pulled a muscle during the most dangerous of activities – having a snowball fight with my kids. This was the type of back pain I hadn’t experienced in years, when I used to weigh nearly 300 pounds. For the first 2 days, I was laid up in bed and it took everything I had just to stand up. Every day the pain got a little better, but my back was still very tight and sore. I was in no condition to be running. I had one appointment with a physical therapist, who showed me some stretches and strengthening exercises. We got back home in the wee hours of December 21, and I went for a run that afternoon – my first in exactly 3 weeks. I was only 2 weeks out from Frosty Bottom, and I was getting nervous. That first run was rough, and I didn’t have much time for things to turn around. During those 2 weeks, the quality of my runs gradually improved, but I still had my doubts. My last run that was over 2 hours had been the New York City Marathon back at the start of November. Race day came and I was cautiously optimistic. My plan was to take it easy in the beginning and see how I felt. I figured worst case scenario, the course comes within about a mile of my house around mile 30, and I could just bail out at that point if things got really bad. Luckily, I started running with someone I knew fairly well from a running group I go out with sometimes on Monday nights. Chatting with him as we ran really helped pass the time, and kept my mind off of how tired my legs were already feeling. We got to the halfway turnaround point in just under 4 hours, which I was pretty pleased with. This is where the race’s only aid station is located, which was pretty much limited to water, Gatorade, and a few cookies. I refilled the bladder in my hydration pack, mixed in some Tailwind, and we were back on the trail. As we started making our way back towards where we started that morning, the calf cramps started, and would continue to plague me the rest of the race. I had been drinking plenty, so I mostly chalked this up to my lack of recent training. My legs were feeling pretty dead as we reached 30 miles, and I was teased by the possibility of an easy out. I’ll be honest – I briefly considered this option pretty seriously. I wasn’t feeling great, but I decided that it wasn’t bad enough that I would feel good later about DNFing, so on I ran. My friend was still running with me, if not slightly ahead, pulling me along. I had to take semi-regular walking breaks to stretch out my calves, but while I was running, I felt like I was able to keep up a pretty decent pace. I have no doubt my friend could have taken off and finished well ahead of me, but we ran together the whole race. As it was starting to get dark, we saw a beautiful combination sunset/moonrise over downtown Anchorage. It was a clear night with a nearly full moon, so we didn’t end up needing our headlamps until we were nearly at the finish. Finally, we reached the final climb up the big hill at Kincaid Park, and then we were done. In true ultra fashion, there were just 2 people at the finish line to greet us and record our time. Granted, this is primarily a bike race, all of whom had finished hours earlier. I ended up finishing in 8:30:51 – a whopping 20 seconds faster than last year’s time, on a slightly altered course that was about a mile longer. While it may not have been a particularly pretty finish, I discovered it’s definitely possible to run an ultra on minimal training.